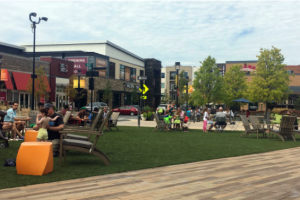 “King of Prussia, Pennsylvania, a major suburban “edge city” outside of Philadelphia, is building a walkable town center. Until recently, King of Prussia included nothing but massive parking lots and car-oriented shopping centers—including the second largest mall in the US—office buildings, and wide, busy thoroughfares. 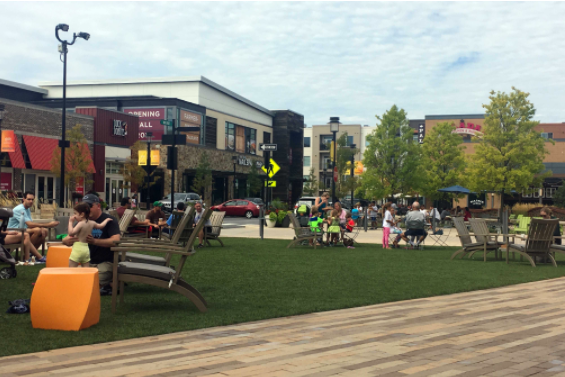 King of Prussia still has all of that, but this suburban retrofit brings human-scale placemaking to the heart of this census-designated place in Upper Merion Township. Key highlights of this suburban retrofit include: lots of outdoor dining; architecture that is eclectic and modern-looking—not traditional like many new town centers; a plaza with comfortable places to sit, programming such as live music and events, and a really fun fountain for the kids; and about 1,250 housing units will surround the shops and restaurants when the project is complete. Once fully occupied, this housing could bump up Upper Merion Township’s population 10 to 15 percent. The project utilizes diverse sprawl repair techniques to create a livable community offering live, work and play options that broaden the tax base, and increase viability for the surrounding businesses.